Claudia Rapp, Project Scholarly Director, creating a codicological description of a palimpsest. 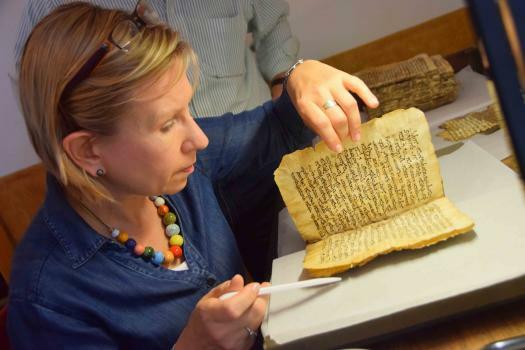 An international team of 23 world-renowned scholars, each an expert in ancient languages and manuscript studies, are working with the project to identify and describe the undertexts of Sinai palimpsests, after they are rendered legible via spectral imaging. 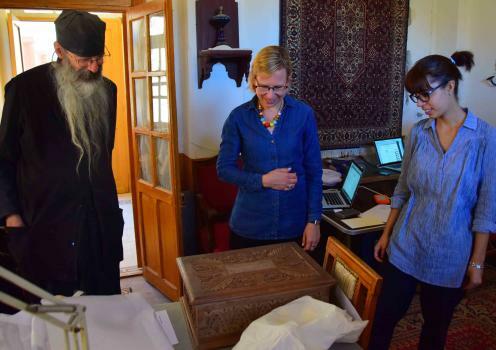 With more than 160 palimpsest manuscripts now recognized in the library of St. Catherine’s Monastery, Sinai may hold the world’s largest collection of palimpsests, and yet in only a minority of cases have the erased texts been identified with confidence. In even fewer cases has a Sinai palimpsest been the subject of detailed scholarly study. Through this project, the great majority of erased texts in Sinai palimpsests are identified for the first time. The palimpsests of St. Catherine’s Monastery preserve classical, Christian and Jewish texts in at least ten languages (Greek, Syriac, Georgian, Arabic, Christian Palestinian Aramaic, Latin, Caucasian Albanian, Armenian, Slavonic, and Ethiopic) and in many ancient scripts. Through the application of innovative techniques in spectral imaging and image processing, the Sinai Palimpsest Project renders visible the erased undertext that has been hidden for centuries. 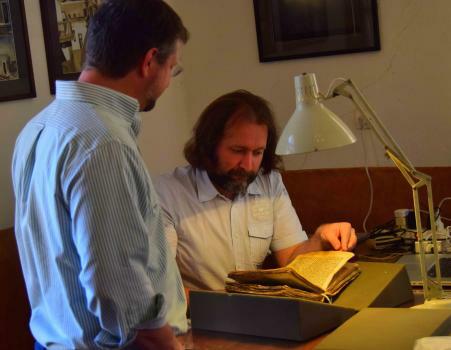 Scholar Grigory Kessel (seated) discusses a Syriac palimpsest. Claudia Rapp, Project Scholarly Director, works onsite to create a codicological description of each written object, prior to image capture. This information both guides the camera operators who spectrally image the fragile palimpsests and enables the scholars to understand the codicological context in which the erased texts are preserved today. Once a palimpsest has been imaged and imaging scientists have processed the spectral data to maximize the legibility of its erased texts, the scholars work in dialogue with the scientists to identify and describe the erased texts and other relevant features that are then presented in a searchable catalog. Doug Emery, Project Data Manager, has worked closely with Claudia Rapp and others to design a sophisticated database of Sinai palimpsests. 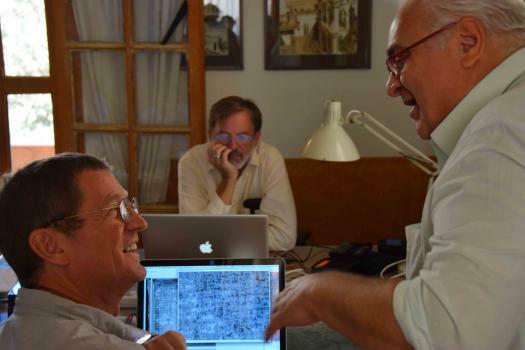 Scholar Agamemnon Tselikas and Scientist Bill Christens-Barry discuss a difficult palimpsest,while Scientist Keith Knox works in the background. Erased text in Ethiopic and Latin, demonstrating the centrality of the Monastery of Saint Catherine in the world of medieval Christendom. Earliest surviving copies of several texts from the Hippocratic corpus, demonstrating the level of erudition in the monastery. Discovery of two previously unknown classical Greek medical texts. A large number of texts written in Christian Palestinian Aramaic, many of them previously unattested, thus adding significantly to the existing corpus of writing in this semitic language, a relative of Syriac, that fell out of use after the 12th century. A surprising amount of yet-to-be-identified texts written in Latin, sometimes in very early scripts. The identification of a folio from a work of the ancient physician Galen, in Syriac translation, which demonstrates the Sinai provenance of a manuscript that is otherwise dispersed among collections of Rome, Harvard, Paris, and a private U.S. collector. A significant number of pages written in different variants of Greek majuscule of the to 4th to the 9th century, thus contributing to a more nuanced understanding of the development of Greek script over time. New evidence for the reconstruction of the history of scripts. The writing of one text over another clarifies their historical relationships, and when different scripts (e.g., Greek and Syriac) are written one over another, evidence for the dating of one script can help date the other. Many double palimpsest folios, as parchment sheets were re-used multiple times.